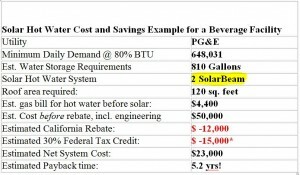 Solar hot water is an important step to reduce energy usage for companies. There are many uses for solar hot water and it is cheaper than installing PV panels. Many people are familiar with flat panels, but due to the inefficiencies, they cannot heat a large home or company. Finally there is a solar hot water system that can provide: space heating, solar water and space cooling. The SolarBeam can replace 10-15 large flat panels because it tracks the sun and can create more solar water than conventional flat panels. Now you can use the SolarBeam solar hot water system for all your hot water and heating needs. 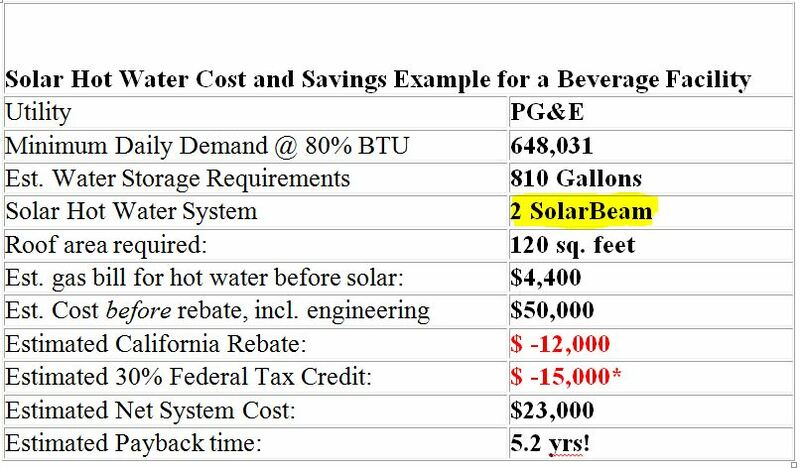 The SolarBeam is eligible for rebates and has already been installed in Pepsi, Universities, Companies and Residential applications worldwide. Perhaps the most widely used green energy technology, solar hot water can provide year-round hot water for your home, pool, or commercial building. Solar water is perhaps one of the most cost-effective solar technology on the market. With federal tax incentives and a base of qualified installers it’s easy to get into this technology. Many large buildings need ventilated air to maintain indoor air quality. In cold climates, heating this air can use large amounts of energy. But a solar ventilation system can preheat the air, saving both energy and money. This type of system typically uses a transpired collector, which consists of a thin, black metal panel mounted on a south-facing wall to absorb the sun’s heat. Air passes through the many small holes in the panel. A space behind the perforated wall allows the air streams from the holes to mix together. The heated air is then sucked out from the top of the space into the ventilation system. Solar water-heating systems are designed to provide large quantities of hot water for nonresidential buildings. The SolarBeam will track the sun and provide 35,000 BTU’s of thermal energy per hour. The system can collect energy from morning to dusk and can heat a lot of water. The SolarBeam can heat the water to 93 C and tips out of the sun when this temperature has been reached. Space cooling can be accomplished using thermally activated cooling systems (TACS) driven by solar energy. Because of a high initial cost, TACS are not widespread. The two systems currently in operation are solar absorption systems and solar desiccant systems. Solar absorption systems use thermal energy to evaporate a refrigerant fluid to cool the air. In contrast, solar desiccant systems use thermal energy to regenerate dessicants that dry the air, thereby cooling the air. These systems also work well with evaporative coolers (also called “swamp coolers”) in more humid climates.